In honor of today being Dia de Los Muertos, may I direct you to this post that I wrote exactly a year ago. It's all about how I'm both a white girl and a Mexican girl and how that plays out in my head. 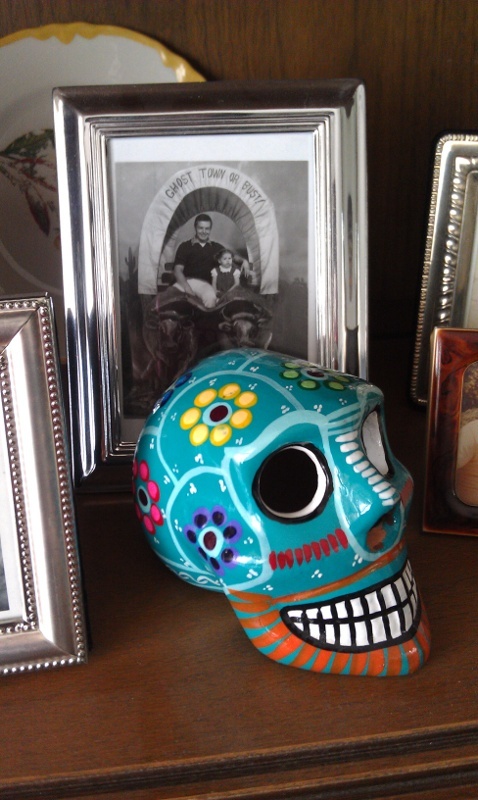 I bought the painted skull in Los Cabos this summer. You can buy those skulls all over in SoCal. A vendor at a little regional fair we went to last month had a booth full of them. Still. My souvenir feels slightly more authentic, having been purchased in Mexico proper. I can't look at that without the theme song getting stuck in my head, which went, "La la la la la la la la la la la la la....Villa Alegre!" (And yes, I counted to make sure I have the proper amount of "la's".) Villa Alegre was a show that came on in the afternoon, after Sesame Street on KCET, our PBS station. I just remember that it was all in English, with a fair amount of educational Spanish/Spanglish thrown in. Good times! Anyway. I hope you hop over to read my Dia de Los Muertos post. Have a grand weekend, and see you back here next week.